On June 10th, 1864, the Fourteenth Connecticut Volunteer Infantry, still at Cold Harbor and with less than 200 men fit for duty, withdrew from the breastworks they had built and went to the rear for rest. Thousands of other men fresh from the front lines drew three-days’ rations and ammunition from long trains of supply wagons. The men of the Fourteenth filled their cartridge and cap boxes and had a bite to eat, but before they were issued any rations, they were ordered back to their works. The men were ordered to keep up a lively fire on the enemy in order to give the impression that the army was still determined to fight along that line, but Gen. U. S. Grant had another plan. Two days later, units of the Army of the Potomac began to withdraw from Cold Harbor and started south toward the James River. The men of the Fourteenth fought deep, pressing hunger as much as they fought the Rebels. Herbs and berries, and whatever else they could forage supplied their only sustenance. At nine o’clock on the evening of June 12th, the Fourteenth Connecticut finally began to march south and west toward the river. It was a warm, sultry, moon-lit night, but the light of the moon was nearly obscured by the thick pall of dust the hung over the road and caked the sweat-dampened skin of the men. The following evening, after marching almost thirty miles and with the James River almost in sight, a band of Confederate cavalry was spotted closing fast from the rear. At nearly the same instant, a larger body of Union cavalry appeared and drove the Rebel horsemen away. Hancock’s Second Corps was the first Union corps to reach the James. They filed into fortifications around Harrison’s and Wilcox’s Landings that had been constructed under Gen. George McClellan two years before. Early on the 14th, Warren’s Fifth Corps arrived and Hancock’s men began to cross the James. (Click here for a great Harper’s Weekly illustration of the Second Corps starting to cross at Wilcox’s Landing, courtesy of sonofthesouth.net. Be sure to scroll down.) You can find Wilcox Landing on Google Earth about three miles southwest of Charles City, VA. The entire Second Corps was across the river by daylight on the 15th, but I am uncertain as to how the Fourteenth Connecticut made the crossing. In the History of the Fourteenth Regiment, Charles Page wrote that the regiment crossed over on a long pontoon bridge, a true feat of engineering that was built just south of Wilcox’s landing. But a soldier in the 108th New York, in Smyth’s brigade along with the 14th, wrote about the “exquisite pleasure of being afloat on the broad bosom of the deep” as they crossed on a steamship. Regardless, the half-starved men of the Fourteenth Connecticut, along with their comrades in the Second Corps, endured another hard march north toward Petersburg, arriving outside the Confederate works on the 16th. They would be thrown into battle almost immediately, but all was not well with their commanding general, the “superb” Winfield S. Hancock. This entry was posted in 1864 - Summer, Overland Campaign - 1864, Siege of Petersburg on June 13, 2014 by admin. Another dawn assault. It was the last thing the veterans of the Fourteenth Connecticut wanted, but they rose and filed into line before first light. At his time in the war each member of the Fourteenth carried a Sharps Model 1858 breech loading rifle and those of Company D had the special Berdans Sharpshooter modifications. The men were told to secure all equipment, anything that would clink or clank, so that they could advance as quietly as possible. By contrast, casualties to the Fourteenth Connecticut were few, one killed and about ten wounded. When they advanced, the rapid fire of their Sharps rifles took a heavy toll on the Rebel pickets. The men pressed toward the stout breastworks of the Confederate main line, and when they came under heavy musket and artillery fire, they dropped to the ground and made the best of a bad situation. The men lay behind the bodies of the Rebel pickets they had shot just moments before and used their bayonets, tin cups and plates to dig up the earth and mound it over the corpses to form their own low breast works. A tenuous and almost friendly stalemate developed. A truce was called. The dead were buried, except those interred within the Fourteenth’s breastworks, and the wounded were taken to the rear for treatment. The combatants shook hands and traded goods and had a fine time, in spite of the circumstances. And then the truce was over and the men headed back to their lines. This entry was posted in 1864 - Spring, Battles of the 14th, Overland Campaign - 1864, Uncategorized on June 6, 2014 by admin. While the Federals marched by longer routes, Lee’s army constructed a formidable line of breastworks along the south side of the Totopotomoy. The four corps of Meade’s Army of the Potomac approached the creek and dug in along the north side—from west to east Wright (6th), Hancock (2nd), Burnside (9th), Warren (5th). The photo at left shows the commanding officers of the Second Corps. At the left is Brig. Gen. Francis C. Barlow, First Division. His wife Arabella was serving as an army nurse and would die that summer of typhus. 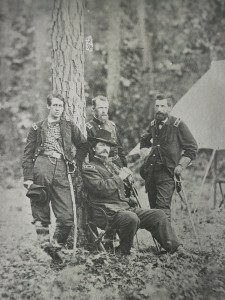 Seated is the commander of the Second Corps, Maj. Gen. Winfield Scott Hancock, who was severely wounded eleven months earlier at Gettysburg. Standing behind Hancock is Maj. Gen. David Birney, Third Division. He was the son of an ardent abolitionist from Kentucky. Birney would contract malaria during the siege of Petersburg and die October 18, 1864. At the right is Brig. Gen. John Gibbon, Second Division, who would eventually rise to command a corps. The photo was probably taken during early June 1864 near Cold Harbor. This entry was posted in 1864 - Spring, Overland Campaign - 1864 on May 30, 2014 by admin. By Friday, the 20th of May, 1864, skirmishing and fighting around Spotsylvania Courthouse had ended, but the killing wasn’t quite finished. A soldier in the 20th Massachusetts, who had deserted three times since the start of the campaign, was executed by firing squad. All of Gibbon’s Division of the Second Corps, including the Fourteenth Connecticut stood silently in ranks to witness the execution. By noon they were marching through Bowling Green. Just beyond the town they turned west onto a road that led to Milford where a halt was finally called. The men built strong breastworks until after midnight. On Sunday morning, after some skirmishing, the cavalry brought in a large group of Union soldiers they had recaptured from the Rebels. Then the Second Corps marched west to the vicinity of what is now Ruther Glen and turned south toward the North Anna River. Confederates north of the river offered token resistance, then torched the railroad bridge as they withdrew to breastworks on the south side of the river. The Harper’s Weekly drawing below depicts the burning of that bridge. The Fifth and Sixth Corps were heavily engaged at Jericho Mills to the west, but the Second Corps was involved only skirmishing, some of it sharp and deadly, but no major battle. (Click here for a map of the North Anna Battlefield.) Col. Samuel S. Carroll had been wounded during the fighting at the Mule Shoe on May 12th, and his replacement was the brigade’s former commander, Col. Thomas Smyth. Note the advanced position of Smyth’s Brigade on the map for a better understanding of the following amusing incident from Charles Page’s History of the Fourteenth Regiment, Conn. Vol. Inf. Private Joseph Schlichter of Company B relates an interesting incident in connection with this engagement at North Anna River as follows: May 22rd, I864, we reached North Anna and the regiment immediately set to work building fortifications which were completed early in the evening. Being very tired, we didn’t stop to pitch our tents, so we lay in the open field to sleep. My tent mate said to me, “Joe. l wouldn’t lay on your back and have the moon shine in your face for it may injure your eyes’ eyes. I only laughed at him and fell fast asleep. On the 23rd, we bivouacked on the banks of the North Anna River and that evening I discovered I was moon blind. I began to think Comrade Chaplie’s words had meaning in them, but I didn’t give it away just then. On the morning of the 24th, we crossed the river and immediately deployed as skirmishers. We advanced toward the rebel lines and kept the earthworks under a heavy fire until dark. The rebels formed a flank movement which compelled us to retreat. We retreated for about a quarter of a mile in good order when we again formed in a line or battle. Presently Adjutant Hincks, who was commanding our regiment at that time. asked “Is Joseph Schlichter here ?” I answered “Yes sir.” “Will you go out and see if we have an outpost or not, or whether there are any men between the enemy and us?” he said. I didn’t like to tell him I was unable to go on account of moon blindness, fearing I might be thought a coward, so I started. After picking my way the best I could toward the enemy’s lines for some time I received the challenge, “Halt. who comes there?” “Friend without a countersign,” replied. “What regiment do you belong to?” he asked. Thinking these were rebels I answered. “The Sixteenth North Carolina.” I was immediately ordered to lay down my arms and surrender which I did. “What regiment do I surrender to?” I asked. “The Fifteenth Massachusetts,” was the reply. “All right. I am glad to hear it for l belong to the Fourteenth Connecticut,” I said. And so, dear readers, I need your help to make sense of this incident. What malady could cause someone severe vision loss for a period of six weeks? All serious comments and suggestions are welcome. This entry was posted in 1864 - Spring, Overland Campaign - 1864, Uncategorized on May 23, 2014 by admin. While the armies were locked in a deadly stalemate around Spotsylvania Courthouse, a private and poignant scene was being played out a several miles to the north at a Federal military hospital in Fredericksburg. 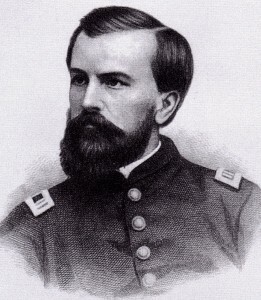 Captain Samuel W. Fiske, Company G of the Fourteenth Connecticut, was dying with his young wife and his two little children at his bedside. If you have not already done so, please read my post a.k.a Dunn Browne to learn more about how and why this minister of the gospel became an officer in the infantry. Also of special interest is my post Captain Fiske: Dead or Alive about his capture during the Battle of Chancellorsville. I believe a good deal more might be made by a different course of proceeding, that our boys are something more than shooting machines, or if machines, that there are strings and pulleys and wheels in them that mere military orders don’t reach, and yet which might have much effect in deciding battles—these great and terrible battles that are to decide this opening campaign, and probably bring the war to an end—these coming successes (as we devoutly hope) that are to atone for the disgraceful reverses our arms have this spring sustained in every quarter where they have been engaged. Oh for power to speak a word that might thrill the breast of every Union soldier and rouse in him that holy enthusiasm for our right cause, which should make every blow struck irresistible, and carry our arms victorious right into the citadel of rebellion, and conquer a right peace. One or two of Meade’s modest, earnest orders, published to the army near the Gettysburg times, had a wonderfully happy effect. I trust more may be issued, and that every opportunity may be taken to inspire the patriotism and enthusiasm of our troops, and keep before their minds the great principles which first sent them forth from their peaceful homes to fight for endangered liberty and republican government, for God and freedom throughout the world. Early on the morning of May 6th, during the Battle of the Wilderness, Captain Fiske was leading his company in an attempt to stem the frenzied assaults of Longstreet’s corps when he was struck in the chest by a single bullet. When his men were forced to fall back, they carried their stricken captain to the rear. After receiving cursory treatment at a field hospital, he was sent to Fredericksburg by ambulance. Amen, Brother Fiske. You fought the good fight to the end. This entry was posted in 1864 - Spring, Men of the 14th, Overland Campaign - 1864, Uncategorized, Wilderness & Spotsylvania on May 16, 2014 by admin. SPECIAL EDITION: 150 YEARS AGO TODAY fighting raged at Spotsylvania from the first light of dawn until well after midnight. It was in my opinion the most brutal and ghastly day of the entire Civil War. In the overnight hours Hancock massed the Second Corps by divisions three lines deep. Gibbon’s Second Division, which included the Fourteenth Connecticut in the Col. Carroll’s Third Brigade, formed the third line. Wright’s Sixth Corps was to support the advance. The assault stepped off in silence, in heavy fog and drizzle at about 5:00 a.m., its objective a salient in the Confederate line known as the Mule Shoe, because of its distinctive shape. The front line of the assaulting column closed on the salient in silence, until alert Confederate pickets rose the alarm. When the men of the Fourteenth vaulted into the works, they captured more prisoners than they had in their own ranks for the second time in their history, the first being at Gettysburg. Brig. Gen. George Steuart was among their prisoners. They also turned two of the Confederate guns around and, under the direction of Lt. Col. Moore, some of the men served a brief stint in the artillery. The assault of the Second Corps drove the Confederates about half a mile back to a second line of works that Lee had had built for this eventuality. The assault ground to a halt and a determined counterattack reversed the tide. The men of the Fourteenth lifted the two captured artillery pieces over the works and sent them to the rear along with their many prisoners. Then they started to dig a trench along the outside of the Mule Shoe works, making the breastworks as formidable on the outside as they were on the inside. Charge after charge by the Confederates drove the Federals back into the Mule Shoe. Much of the fighting was hand to hand. The bayonet was used freely and often. The fighting, much of it during heavy rain, was most severe at a slight angle in the west side of the salient that became known as the Bloody Angle. The firing was so intense here that a twenty-two inch diameter oak tree was cut down, mostly by Federal rifle fire. The stump of this tree resides in the Smithsonian. The fighting finally wound down after midnight. Lee started to withdraw his men from the Mule Shoe to a second line of breastworks his engineers had been working hard to build while the fight raged. Members of the Fourteenth Connecticut were among the first Federals to go inside the Mule Shoe works the next morning. Charles Page described what they saw. FICTION CONNECTION: In my novel An Eye for Glory, Sgt. Michael Palmer is a member of the first detail to enter the works on the morning of the 13th. The grisly carnage all around crushes him. This entry was posted in 1864 - Spring, Battles of the 14th, Overland Campaign - 1864, Wilderness & Spotsylvania on May 12, 2014 by admin. Hancock’s Second was the last corps of the Army of the Potomac to march out of the Wilderness. They served as the rear guard of the army until it was clear that Lee was concentrating his Confederates around Spotsylvania Courthouse. The distance was short, only five or six miles, but Lee’s cavalry delayed the Federal advance, and Warren’s Fifth Corps, which left their lines in the Wilderness during the night of May 6-7, didn’t reach Spotsylvania until the morning of May 8th. Confederate infantry occupied a low ridge known as Laurel Hill and they had built a stout line of breastworks along its crest. Warren made several unsuccessful and costly assaults against these works. Later in the day Sedgwick’s Sixth Corps arrived and an evening assault by both corps also ended in defeat. 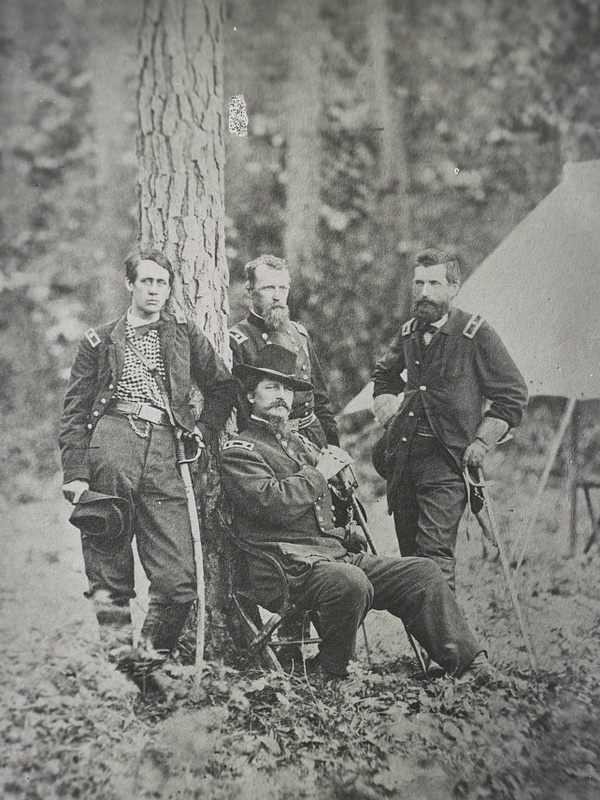 The morning of May 9th, Gen. John Sedgwick was shot in the head by a Rebel sharpshooter shortly after saying, “They couldn’t hit an elephant at this distance.” Command of the Sixth Corps passed to Gen. H. G. Wright. Hancock’s Second Corps finally arrived and was directed south across the Po River to threaten the western flank of Lee’s army near the Block House bridge. (Click here to view a Wikipedia map of the positions late in the day of May 9th.) Lee countered this move by sending a couple of division to secure the flank. On May 10th, Warren wanted one more chance to assault the Laurel Hill works. Gibbon’s Division of the Second Corps was withdrawn from across the Po and added to the assaulting force. Before the men of the Fourteenth Connecticut went into battle, an officer from the Fifth Corps who happened to be passing near their line, was seriously wounded in the leg. The regimental surgeons set up a makeshift operating table and performed an emergency amputation right in full view of the men. We were in line pretty early in the morning (May 10th) and expected some hot work before breakfast when we recrossed the Po. After marching around considerable our division (Gibbon’s) was ordered to go to the support of another corps (Warren’s Fifth) which was having a hard fight, and being driven back. At this time the woods were on fire in different places and the enemy were throwing shot and shell at a rapid rate right into our teeth as we advanced to the front, How we got through it all I don’t know, but we were kept right along until we came near their breastworks and had a hot and heavy time of it until our seventy rounds of ammunition were exhausted, when we were relieved and ordered to fall back about one hundred and fifty yards where we received more ammunition and then threw up a line of breastworks for our protection during the night. This breastwork business is getting to be a great thing in the army and it is the first thing we have to do as soon as we come to a halt. It don’t matter how far we advance, we find the rebels have thrown up breastworks to impede our progress, and if we gain an inch of ground from them, we put one up at once for its protection. Grant is sticking to them like a leech and I think we are getting the best of it. This entry was posted in 1864 - Spring, Battles of the 14th, Overland Campaign - 1864, Uncategorized, Wilderness & Spotsylvania on May 9, 2014 by admin.